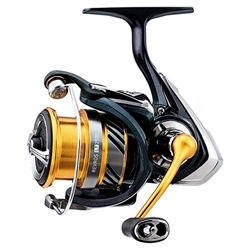 The new REVROS LT incorporates the LT Concept of light but tough in a proven reel design. The spinning reel’s weight was reduced by 2 ounces in the 2000 model. The Light Composite Housing greatly inproves the strength to weight ratio while still providing a solid framework for the powerful gearing. The Machined Aluminum Handle smoothly transfers power to the main gear. The Air Rotor System is 15 percent lighter than compatable rotors and well balanced for smooth positive retrievals.